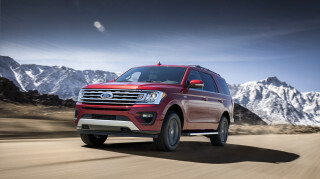 As more and more upscale buyers shop for sport-utility vehicles, automakers have been tripping over themselves to bring luxury-equipped trucks to this evergrowing market. 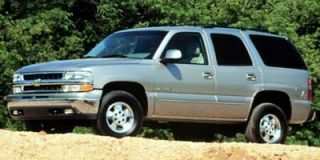 General Motors is no exception. To satisfy both GMC and Cadillac dealers, a re-trimmed Yukon - itself a top-shelf Tahoe - has been introduced as both the Denali and Escalade to meet customer demand. For the traditionally utilitarian GMC marque, the posh Denali is stirring the waters a bit, but it's the Escalade that's making big waves as the Cadillac brand's first truck in its 96-year history. 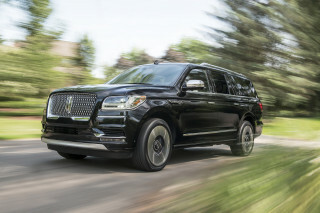 The upgrade from plebeian Tahoe status carries a price tag of about $15,000 and includes such niceties as soft leather, genuine Zebrano wood, and heated seats, for starters. Then there's the Bose CD player in the dash - not to mention the changer in the console - with audio controls and headsets for the second-row (but not second-class) passengers, who also get their own air conditioner. 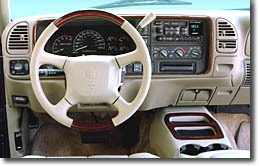 Escalade's dash and steering wheel (left) get ritzier wood than the Denali's console (right). Monochromatic lower body cladding, a unique front end, and chromed wheels comprise the exterior treatment. 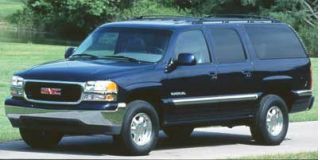 These bolt-on curves, combined with vogue jeweled headlamps and unique grilles - egg-crate style for the Caddy and horizontal slats for the GMC - actually do a good job of setting Denali apart from the crowd of Tahoes and Yukons on the road, especially up front, where the makeover is most dramatic. Mechanically though, they are hardly different. Some 255 horses are on tap from the venerable 5.7-liter pushrod V-8 under the hood, which is plenty of grunt for everyday driving, hauling this heavy truck to 60 mph in 10 or 11 seconds. Gear changes from the four-speed automatic can be a tad harsh, but otherwise the drivetrain is solid and effective throughout the speed range. Directing power to the six-spoke shiny wheels is the AutoTrac active transfer case. 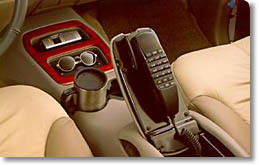 Buttons engage two-wheel drive, an automatic full-time 4WD, or a part-time mode that locks the center differential. A low range is also available for tractor pulls and descents of high mountains. Towing capacity is 6,500 pounds. On-road handling is typical for a tall truck tipping the scales at 5,500 pounds. The standard IFS/live axle setup from the Tahoe and Yukon is fitted with heavy-duty Bilstein dampers, but still, quick directional changes are best kept to oneself. 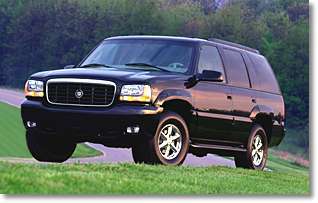 On the highway, though, these vehicles are capable cruisers, with comforting stability and a supple ride. As the EPA estimates 16 mpg at speed, fuel economy doesn't exactly pamper the wallet, but it is on par with other full-size V-8 SUVs, and the 30-gallon tank provides a decent range. Don't even think of taking GM's new luxo-trucks far off-road. 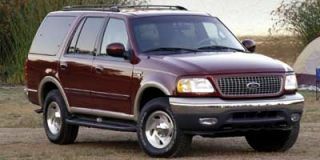 With running boards, long overhangs, and an unshielded underbody, doing much trail-crawling could get expensive, fast. 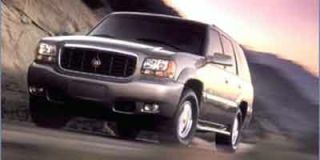 In deep snow or on a rutted road, however, Denali and Escalade would confidently and comfortably pull you through. 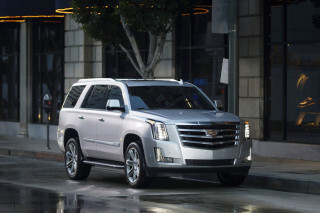 Optional on the Denali and standard on the Escalade is the OnStar assistance system. Using both cellular and GPS technology, it can save your life (by calling for help automatically if airbags deploy) or your marriage (by asking a human being for directions without stopping). One of the best features, perhaps, is remote unlocking, which saves a call to the locksmith if your keys get locked inside. Free for a year, the 24-hour-a-day service incurs usage charges thereafter. Cadillac dealers charge more than $45,000 for the Escalade, but they make the purchase easy; there are no options and only four colors: white, black, sand, and red. But if you take a trip to the GMC showroom, you can get a Yukon Denali with nearly the same equipment list for a few thousand less. If deciding between Denali and Escalade is your dilemma, you might want to skip the longer warranty and rear heated seats offered by the flagship division and save some money on the virtually identical GMC. 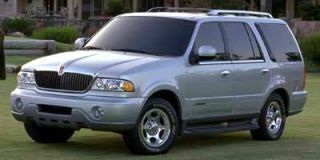 The smartest money, however, is likely waiting a year or more until the new GM luxury SUVs should debut. Based on the platform introduced in this year's Chevrolet Silverado and GMC Sierra, they will offer stronger brakes, new engines, a stiffer structure, and will likely look and behave a lot more comfortably in their fancy clothes. 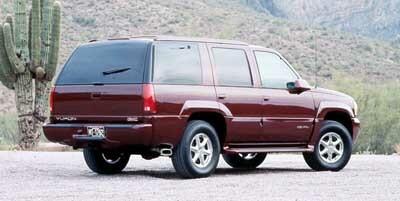 Looking for a different year of the GMC Denali?